Following a long wait, Bengaluru inaugurated its very own National Gallery of Modern Art earlier this year. Functioning under the Ministry of Culture, Government of India, National Gallery has its head quarters in New Delhi, and another centre in Mumbai. Originally established in 1954, NGMA developed as a premiere institute for the housing and display of modern and contemporary art objects, of which they currently have more than 17,000. Over 500 items from this collection – paintings, sculptures, prints – were selected to be part of the inaugural exhibition at the Bengaluru centre with the title of ‘Signposts of the Times…from the collection of the NGMA’. ‘Signposts of the Times..’ show, ground floor, contemporary art section. Pic: Krishna Prasad, NGMA. Set up in February this year, the exhibition will be on display until a concrete plan for the next series of shows is made, which is, as of now indefinite. NGMA Bengaluru is housed in the 90-year-old Manikyavelu Mansion, off Palace Road. The heritage residence, set in 3.5 acres of park area was transformed into a museum space by Venkatraman Associates, Bangalore. The complex now has additional blocks for an extension of the gallery display, an auditorium, library, offices, cafeteria and museum shop, designed to match the original architecture. With a total display area of close to 3000 square metres, the gallery’s presence is a matter of pride for the city, but also brings with it a host of expectations in terms of its performance as a centre for artistic activity and its role in the dissemination of cultural knowledge. ‘Signposts of the Times..’ gives one a broad picture of the history of modern Indian art, condensing more than two centuries of artistic endeavor into objects categorised under landmark phases, collective and individual achievement. Beginning with photographs and paintings of the colonial era, the sections of the exhibition displayed in separate galleries cover art in India through the nationalist movement in Bengal and further modernist developments of the Bengal school; western prints of Indian scenery; the work of individual artists who brought varying influences into the growing character of Indian art. Until here the display takes on an easy chronological narrative, with veritable gems of art to be seen – Abanindranath Tagore’s gentle washes, Raja Ravi Varma’s ethereal women, Nandalal Bose’s bold tempera figures, Amrita Shergil’s hybrid mix of French impressionism and Indian Miniature, Jamini Roy’s vivid folk sensibilities. The next sections, comprising two large segmented halls, are given over to a selection of works tracing developments during and after independence when a more radical pan-Indian movement in art took place, with regional groups coming together to express new Indian identities, experimenting with influences varying from local tradition to western art movements. The display takes on a mixed arrangement, with attention to visual balance more than specific sequence or grouping according to schools of aesthetics. Paintings by Raja Ravi Varma, part of the ‘Signposts of the Times..’ show. Pic: Krishna Prasad, NGMA. Despite there being explanatory panels at the entrance, and some more awe inspiring art, it is with difficulty that a lay person will follow the multi-layered movements that make up modern and contemporary Indian art history. There are also noticeable gaps in the modern art narrative, with the absence of several well known figures resulting in scanty representation of the entire collective movement, for example F N Souza (1924-2002) from the Progressives, and Bhupen Khakar (1934-2003), one of the leaders of the Baroda group. The post modern section is non-existent, there being work of only a handful of artists from the current generation like Bose Krishnamachari (b-1963) and Hema Upadhyay (b-1972). Last week saw the opening of ‘Satyajit Ray: from Script to Screen’ a suite of photographs by Nemai Ghosh in one the halls at the Gallery. The show itself had been displayed three months earlier, but was inaugurated once all provisions could be made for the invited persons to attend. An absolute must see, the exhibition showcases Nemai Ghosh’s moving black and white narrative style with the camera, capturing in portrait and spirit the charisma of Satyajit Ray and his life as film maker and creative genius. Painting is the medium represented to the largest extent in the main display Signposts of the times..*, followed by sculpture and a minimum number in prints, and no works in multi-media, video art or installation, all thriving contemporary art mediums that the general audiences need to be aware of. Each work has a label with name of artist and medium of work, and in most cases, year of work also. They are now in the process of redoing the labels with more comprehensive information, including birth/death years, and are compiling complete biographies of every artist present. The major narrative is on panel boards near entrances – there is no portable/paper literature. Museums as spaces of public interaction with history and culture are unfortunately inadequate in India. The validators of art and the deciders of its value are private galleries and auction houses, not museums and government art institutions, like in the West. Governments, both state and central do not allocate sufficient funding to keep up with the escalating prices of contemporary Indian art in the art market (though prices have straightened out after the downturn). The infrastructure necessary to store and display multimedia, video and installation of art is also not there in government-run institutions. As a result of all this, the general public is deprived of a comprehensive picture even in the National Gallery. Recent developments however indicate a definite change in the current arrangements, as well as improvements in the functioning of several museums all over India. The Apex Committee is honorary and mainly responsible for making suggestions towards the development and improvement of the gallery and proposing an agenda for art shows encouraging southern art identities among others. They maintain communications with the Culture Ministry and authorities in Delhi and attend official planning meetings and other discussions pertaining to the betterment of the gallery. Individually and in groups they also form part of the sub-committees that overlook the development of the various departments of the gallery – for example library purchases, museum shop organisation, cafeteria management, public programming, and so on. ‘Signposts of the Times..’ show, ground floor, contemporary art section, with a sculpture by Alex Mathew in the foreground. Pic: Krishna Prasad, NGMA. Sircar made several heartening comments during the inaugural ceremony itself, stressing on the renewed support to the art and culture professionals from the Ministry of Culture. A member of the Apex Committee, Bengaluru based artist Ravi Kashi shared the salient points of the previous meeting, and the current series of discussions that took place prior to the ceremony. In September 2009, a joint meeting of the apex committees of Delhi, Mumbai and Bengaluru NGMAs took place in New Delhi, where formally a decision was taken to appoint regional Directors for the two branch galleries. It has also been agreed that a functional autonomy will be given to both the Bombay as well as Bengaluru NGMA’s, under the Director. As government processes tend to take time, a temporary position will be filled until the right person is nominated and takes on the Directorship. S G Vasudev, another member of the Apex Committee, shared that funds have been allotted for the Directors position, and two other assistant posts for the curatorial administration of the gallery. The list of requirements put together earlier by Bengaluru’s Apex Committee was also reviewed, which included a priority list of twenty eight points concerning matters of administration, budgeting, exhibition content, physical infrastructure, amenities and audience related issues. The recent meeting of the committee was a continuation of the previous discussions and was in fact the first occasion when it met independently. In the presence of the Secretary this time, structural problems within the gallery were evaluated and listed, particularly the inconsistent lighting, both natural and artificial, partially unfinished painting, flooring and electrical wiring, and security settings. These will be looked into by the Central Public Works Department on priority. In the future, plans will be made to welcome different curators and funding will be provided to produce shows for the gallery that will take place in rotation, so the gallery is not required to depend on Delhi for exhibitions, but will have the benefit of hosting international shows through them. 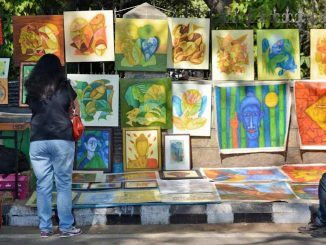 Procedures for fresh purchases to fill the gaps in the current collections are on hold, as the government policies concerning buying of art are being assessed and altered. Ravi Kashi was positive however, that this time the results will definitely be visible to the public in a relatively short while, as the Secretary has assured speedy action, and the Apex Committee members and staff of NGMA are committed to following up on every issue. *: Updated 10th November 2009.